Don’t allow leaves to pile up in your yard this fall! Contact JFK today and learn about all of our leaf removal services! To many homeowners, leaves are a real menace. 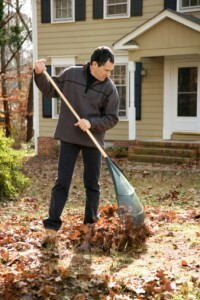 During the fall months, leaves can quickly pile up and removing them can seem like an impossible task. It is an essential chore because leaves can clog storm drains and suffocate grass and plant beds. Also, during the fall season, grass goes through a rejuvenation process, and it is important that leaves are not covering grass for extended periods. JFK Lawn & Landscape has fall cleanup and leaf removal services that will protect your property’s beauty! We service all of Howard County so give our experts a call today and let us do the dirty work for you! Did you know that leaves that cover more than 20% of your lawn can smother your grass during the winter months and then prevent grass growth the following spring? On top of that, an excess of leaves can also cause snow mold. In addition, JFK leaf removal services ensure that driveways and walkways remain clear to prevent slips and falls! How Often Should Leaves Be Removed? There are a few factors that should be taken into account when deciding how often you need to remove the fallen leaves from your property. The number and type of trees on your property (and your neighbors) will affect how often leaf removal needs to be done. If you have a large lot and no place to dispose of the leaves, you may need to do removal multiple times to keep up with the volume. Also, try to remove them before any heavy rains are forecasted. Keep your gutters clean this fall with the help of a trained professional! 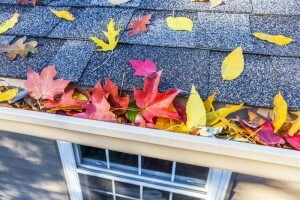 Don’t forget about your gutters this fall! A clogged gutter can lead to overflow which can back up into your home or flood your basement. Cleaning gutters is a dangerous job because you usually need to climb a ladder! Don’t put yourself in harm’s way and let one of our experts at JFK clean your gutters this fall! Have you ever considered creating a compost for your property? It will allow you to take advantage of those pesky leaves that litter your yard every year. It is nice having access to fresh organic soil supplements for all your gardening needs. You can also use it as a place to toss away any grass clippings or dead plant matter. JFK has 3 ways to SAVE you money on this project. # 1 – Refer a neighbor to us to get a discount. If you email us your adjacent neighbor’s contact information and if we do the leaf removal in both yards at the same time, we will discount you 10% on the service! (10% off your service fee, with a maximum $25 for each customer referral). # 2 – Refer a friend to us who has not used our service and we will pay you $ 25 for each customer referral. # 3 – Are you a FIRST TIME JFK CUSTOMER? Let us know and ask for another $ 25 off. These offers are only available on our website and this blog. Please ask for these discount during your initial service request. This entry was posted on Sunday, October 1st, 2017 at 3:11 pm. Both comments and pings are currently closed.